The Raleigh Boychoir's 50th anniversary season has been full of monumental performances, and the season's conclusion was no different. The RBC is one of the first outside performing groups to perform in Raleigh's Holy Name of Jesus Cathedral, which has been open for less than a year. The cathedral proved to be a good venue for the Boychoir and the particularly chosen repertoire, with its intense reverberation and natural amplification of sound. Not only did the RBC perform there, but they were also joined by the Holy Name of Jesus Cathedral Choir, led by director Michael J. Accurso. One unique thing about this concert was that about half of the performances on the program took place behind the audience, in the choir loft located above the nave. This made sense from a visibility standpoint and to include instrumentalists (organ, violins, etc.). Performances with only the piano took place in front of the altar, including the final combined numbers. However, the acoustics in the cathedral insured that all performances could be easily heard, despite being located behind the audience. The program was full of reverent, serene music, which of course was fitting for the space. To start off the sacred-focused program, the Cathedral Choir performed Francisco Durant's five-movement Magnificat, which explored both legato and fugal textures seamlessly. It was a beautiful piece to hear in the cathedral, especially combined with a sharp chamber orchestra and organ (played by Josh Dumbleton). Several congregational hymns throughout the program served as transitions for the various ensembles to move into place. The RBC's Training Choir (conductor Katie O'Neill) was an adorable sight under the huge dome of the cathedral, but they too could be heard and understood well, especially for the sweet "Love One Another." The Resident Choir (conductor Danny Yancey) performed an energetic "Ave Maria" (Fauré), which featured a precise balance between voices and the active piano part, played expertly by RBC's Megan Yohman. One of the definite highlights of the program was John Rutter's Visions, an ethereal, four-movement work brought to life by the Performing Choir, violinist Kevin Yen, harpist Angelyn Fanlo, and Dumbleton on the organ. Though inspired greatly by Gregorian chant, the work itself is less than two years old, weaving multiple textures and tonalities together mysteriously. Jerusalem, or "the Holy City," as the final movement depicts, is shown as less of a literal place and more symbolic of ultimate peace and Utopia. The text sung is a mosaic of old English hymns and Biblical passages, often from the book of Revelation. No matter the language, the Boychoir's pure diction of vowels was apparent here. The Boychoir's Young Men's Ensemble saw the graduation of two senior members, and performed a soaring arrangement of "Make Me an Instrument of Thy Peace," before the world premiere of Rollo Dilworth's commissioned piece "Let Me Ride." This exuberant performance by the Tour Choir was a very special moment for all. The concert closed with all singers (Cathedral Choir and RBC Alumni included) singing several Rutter selections, including the traditional "The Lord Bless You and Keep You." The full sound of the huge choir, standing in front of the altar, was lovely with these lush and beautifully arranged pieces. 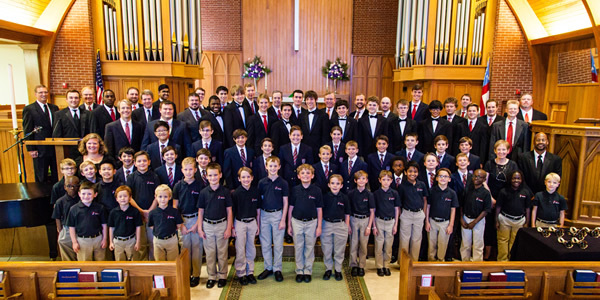 If you can't get enough of the Raleigh Boychoir, be sure to check out the 50th Anniversary Gala, "A Night to Shine" on June 30, where the Tour Choir will give their final performance of their June state tour (which also includes stops in Charlotte and Wilmington).